The Dime List brings you luxury travel trend destinations to help you find peace of mind. Slowing down and spending some time immersed in a pristine, natural environment can work wonders to renew the soul. When longing for the next escape, check out The Montage Hotel at Kapalua Bay in Lahaina, Hawaii. The Hawaiian word , Pono, loosely translated to English means righteousness. But the word also has the implicit meaning of a state of harmony and balance. It is also the objective of the practice of Hoʻoponopono, the Hawaiian tradition of reconciliation and forgiveness. Though a relative newcomer to the island of Maui, the Montage Hotel Kapalua Bay is a luxurious resort that awakens the spirit and restores vitality. Many of today’s luxury travel trend destinations include superb dining, magnificent views, all-suite accommodations and championship golf. Its clear why The Montage has quickly become one of the top choices amongst distinguished visitors to Hawaii. Available in 1, 2, 3 and 4 bedroom suites, the residences at Montage Hotel offer a mix of tasteful design and details that please the most discerning guest. Thoughtful, luxury amenities in the Ocean View suites include plush bathrobes, towels and bedding, dual sink bathrooms with deep soaking tubs, and a full kitchen. 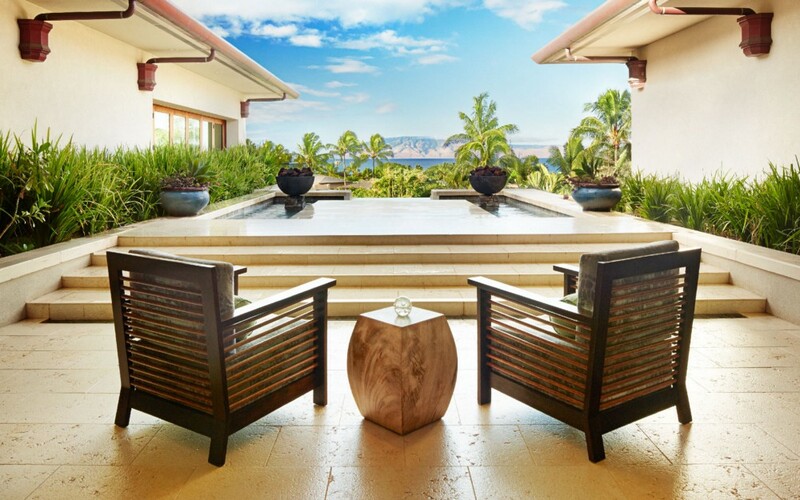 Just as the indoor space is functional and fashionable, the outdoor lanai daybed and spectacular view of the Pacific Ocean and Kapalua Bay is perfect for soaking in the sun and salt air. With stylish, modern furniture, and deep hardwood accents, the soothing design invites guests to feel perfectly at home during their stay. For a quick drink, stop at the Hana Hou. This casual bar has but a few tables, with an amazing view where guests can take in the splendor of the Pacific Ocean. The views of Lanai and Molokai put the mind at ease and help guests settle into their casual island state of mind. The beverage menu is a blend of traditional and modern libations, sprinkled with exotic island flavors. The Mai Tai is a DimeList favorite. If rum isn’t the preferred spirit, then try the Sazerac. An historic New Orleans classic, this famous cognac and absinthe cocktail is a solid choice with a serious punch. For a taste of modern Hawaiian cuisine, reserve a table at Cane & Canoe. With the high ceilings and a timber pitched roof, the architectural style is reminiscent of an Hawaiian communal gathering space. While the interior incorporates fragrant floral touches, fine wood details, and modern furnishings and finishes. Executive Chef David Viviano uses only locally sourced produce and the freshest seafood and meats. The menu includes authentic flavors that appeal to a wide range of palates, with a flair for distinctly Hawaiian fusion creations from both land and sea. For seafood fans, the Pacific Rim Cioppino is a must have. Prepared with half of a Kona Lobster, succulent Kaui shrimp, and flaky Mahi Mahi, all served in a savory kaffir lime-tomato broth with rice, tomatoes and hearts of palm, it is truly a gastronomic delight. Pro tip: Don’t miss Sunday Brunch where you can create your own Bloody Mary masterpiece and indulge on brunch favorites like steak and eggs. shrimp and grits, and our personal favorite, the chicken and waffles. Pono is truly within your grasp when you spend quality rejuvenation time at the Spa. Replenish your body and soul in the pleasantly fragrant cedar sauna, or awaken your senses in the eucalyptus steam room. Perfect your tan at the infinity pool and soak in whirlpool spa. Another luxury travel trend is a great workout, yoga classes and core workouts assisted by expert fitness trainers are available. The most enjoyable luxury travel trend is to get out there and experience some true local flavors of your destination. Maui has no shortage of activities, especially for those that enjoy the outdoors. Horseback riding, hiking, and helicopter tours of the islands are all perfect daytime activities for the family. For a more adrenaline-filled afternoon, check out the exhilarating zipline tours offered at both Kapalua and Ka’anapali. There is world class sport fishing offshore and on the coast of Maui, with boat rentals available for anglers. Snorkeling and catamaran rentals offer a serene escape for guests that prefer just to relax and explore the sea, or the guest pool cabanas offer guests a golden opportunity to lounge at the pool and soak up the Hawaiian rays.